From January to May 2014, I studied and worked with CHI Academy member Jodi Forlizzi to develop tablet screens for social and data interactions among caretakers (physical and occupational therapists), mObi robots, and physical therapy patients at the Vincentian Collaborative System. How can we design visuals for a tablet on a robot that can better connect patients with their caretakers at the Vincentian Collaborative System? 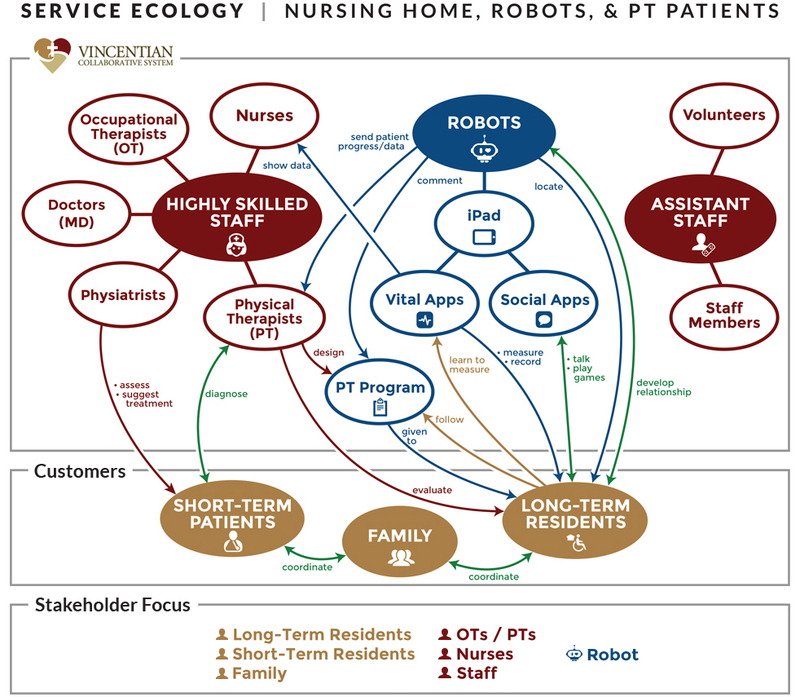 I first mapped out the stakeholders evolved in the service ecology between the caregivers/robots and patients. I narrowed the stakeholder focus down to long-term residents, short-term residents, family, occupational therapists, physical therapists, nurses, and staff members. I read several literature papers and educational games that similarly motivate players through the use of robots or virtual caretakers. These findings were incorporated into my resulting personas and designs. I mapped the user needs for each stakeholder involved in the service ecology. I then developed 20 personas and distributed them in 24 scenarios of current state (no robot) and future state (with robot). Due to the time constraints of this project, I chose my target audience to be OTs and LTs. 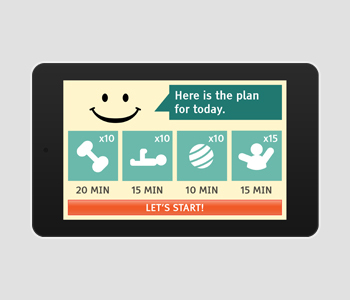 I used my scenarios to craft conceptual interfaces for screens that would go on the robot's tablet. This tablet would be theoretically placed on the robot, both of which would be accompanied by a OT/PT. I produced 74 screens for my paper prototype (1st iteration) and later 50 screens for my hi-fi prototypes. After each iteration, I gathered feedback from my advisor and other student researchers, which helped me determine that Visual screens were favored, especially via adding personality to the robot face. Texture, colors, and gradation were modified to distinguish functionalities. 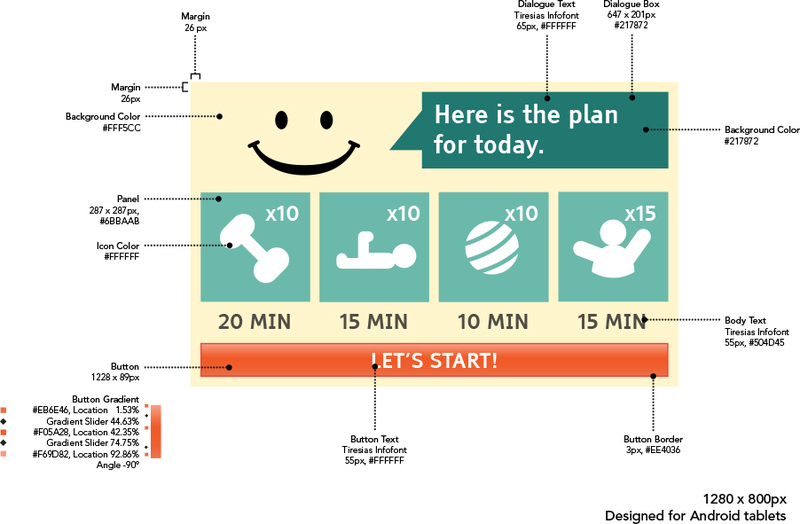 Heuristics were improved, such as the minimization of user input and content on each screen. Below are sample comparisons of different screens and the iterations I had for them. Despite having produced screens for both Visual and Informational sides, I will showcase only the finished Visual screens. * Tablet mock-up: Nexus 7 template from Elegant Themes.